Yesterday’s activities took us all to such heights it seemed impossible to go any higher. But this is Switzerland, remember, and the highs are limitless. The morning after the night before came way too soon for some of us but, regardless, nearly all were present and correct at our Sunday AM meeting point. Ironically, on the last day of the sky season, there was a snow precipitation and Zermatt was covered in a magical mantle of white as we made our way to the Funicular to ascend to Sunnegga where brunch was to be served. Pascal and the Zermatt team had arranged brunch for us at Findeln, a sprawling collection of mountain huts, barns and sheds high over Zermatt in the shade of the Matterhorn. At this time, however, there was no Matterhorn to be seen as dense flurries of snow continued to fall. For 20 minutes we picked our steps carefully down the side of the mountain surrounded on all sides by a winter wonderland. 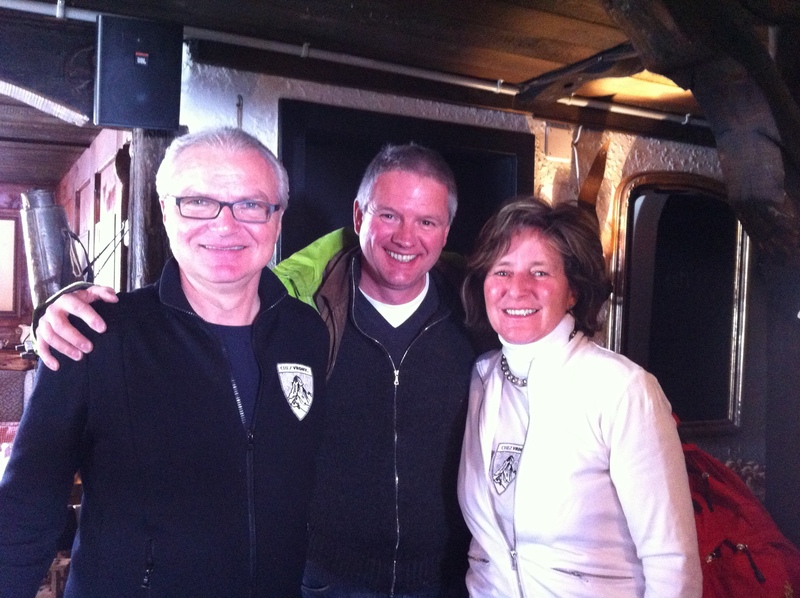 Eventually we reached Findeln and were welcomed at Chez Vrony where a lavish Swiss breakfast awaited us. It took a nano-second to realise that this was a special place. A traditional mountain chalet on 3 floors with irregularly sized and individually furnished dining rooms, it has a random, evolving sense to it. Owner managed by Vrony Julen along with her husband Max, the restaurant has been in the Julen family for 4 generations. Vrony and Max have managed to keep the unique, casual feel of a private home while creating a world class restaurant serving only local home produced produce. 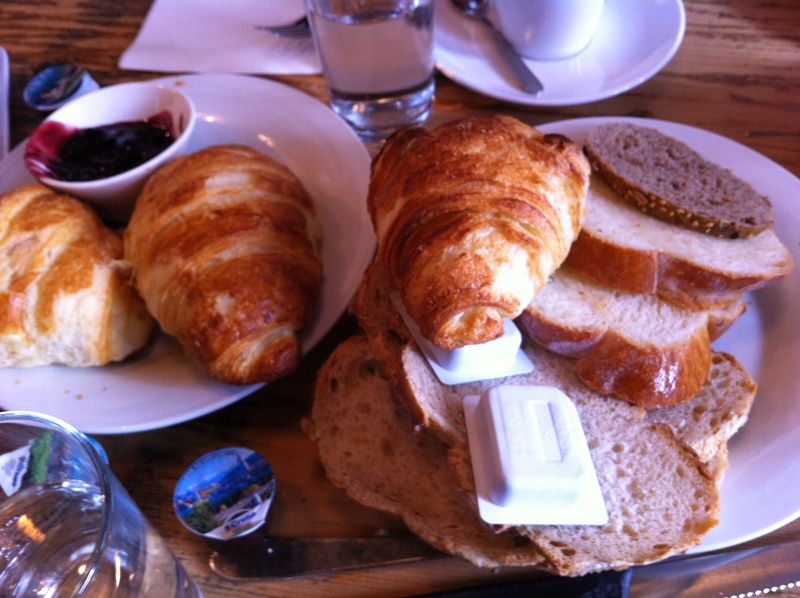 We enjoyed a wonderful breakfast of Bircher muesli, baked breads and chocolate croissants along with amazing cheese and cold cuts made on the premises. A number of us decided post-breakfast to walk down the mountain and back to Zermatt by a twisting mountain path. It felt so good to walk and wonder and feel both lost and found in the midst of something bigger than yourself, the eternal mystery of the nature. 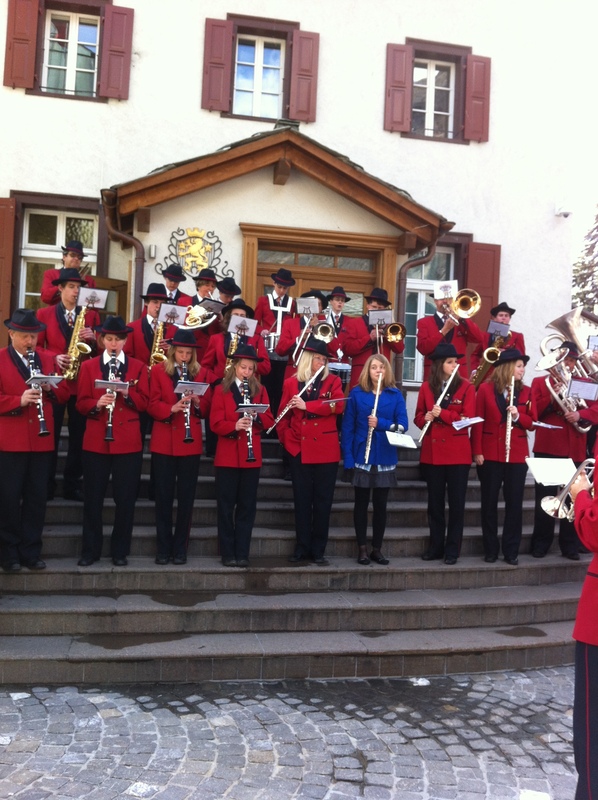 As we arrived into Zermatt the church bells were ringing and a brass band was playing outside the parish church to recognise and celebrate a class of First Holy Communicants. The sun shone under the majestic Matterhorn as families, all dressed in their celebratory finery, lined up for pictures and spoke animatedly with each other. We all noticed the flautist who forgot her red uniform but played nonetheless in the front row of the band all bedecked in blue. By 12:37 we were all aboard the Glacier Express again heading back towards Visp and on to Zurich. Precision and punctuality are absolutes for Swiss Railways as Richard discovered when he descended the train briefly to capture something on camera. He turned his back to take the picture, the doors shut and off went the train. Ever resourceful, Richard simply caught the next train and joined us at the Park Hyatt Zurich with a great story to tell. 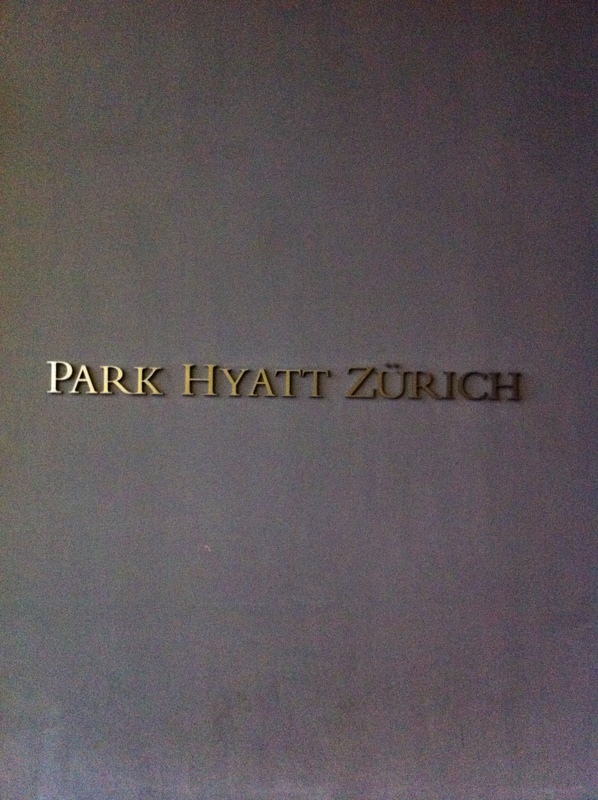 The Park Hyatt Zurich is a luxury boutique property with 142 sleeping rooms the oozes class and refinement. I had stayed there before and recalled the room product as amongst the best I’d ever seen: 38m2 of stunning modern design with cherry wood and muted soft furnishings, original art, fully equipped work modules with multi-volt sockets, B&O flat screen TVs, over-sized bathroom/wetroom, excellent lighting. This time, courtesy of Sales & Marketing Director, Joerg Leser, we were able to conduct a full show around and see the extensive (1000m2) conference and banqueting space as well as the magnificent open-kitchen restaurant and the uber-cool bar. 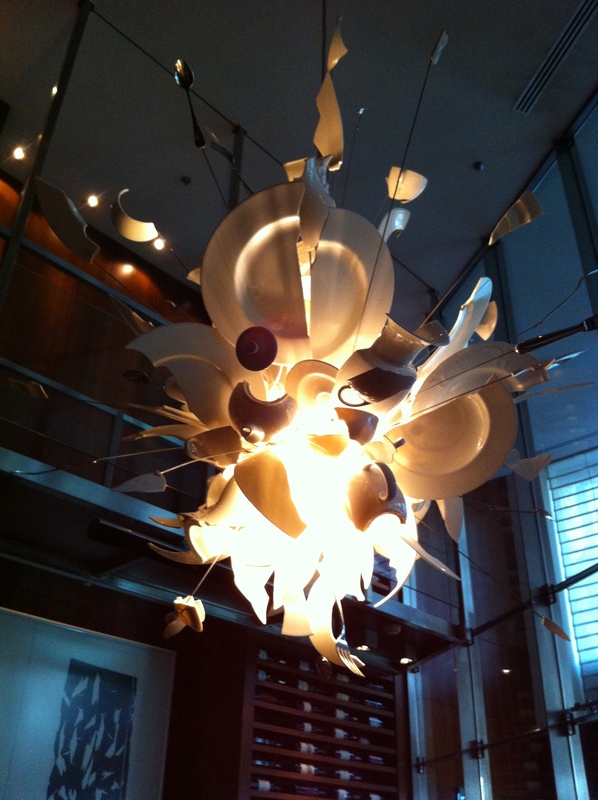 Park Hyatt Zurich is also the chosen location for some stunning contemporary art pieces from the private collection of the Ptrizkers (owners of Hyatt) along with an astonishing, whimsical creation entitled “Porca Miseria” by famous lighting designer, Ingo Maurer. A wonderful site finished at the Onyx Bar where we were treated to beautifully crafted appetisers and glasses of crisp Cloudy Bay. Dinner, courtesy of Zurich Tourismus, followed at Zunfthaus Zur Waag, a traditional guildhall with a suite of magnificent dining rooms and a history stretching back to the 1300. Although most of us were exhausted, conversation flowed freely as we re-lived the delights and highlights of our days together. SCIB’s Virginie Baeriswyl stayed with us until the very end taking care of everything efficiently, seamlessly and with great kindness. With all her Switzerland Tourism and SCIB colleagues – and their many destination partners – she truly conveyed to us the enduring, underlying values of a destination and the destination marketing organisation that represents it. Pádraic Gilligan is VP of Industry Relations at MCI and VP of MCI’s DMC unit, Ovation Global DMC. Ovation has partnered with SCIB in the creation of the inaugural Ovation Trophy, a “marvellous adventure” style journey from Lucerne to Zermatt. Huge thanks again to Urs Eberhard, EVP Markets and MICE at Switzerland Tourism (as he stated hilariously at the Awards Reception “It’s my budget”) and to Barbra Albrecht of Switzerland Convention and Incentive Bureau without whom the Ovation Trophy wouldn’t have happened.